Customize the configuration to your needs! Choose from a wide range of configurations. This functional, great value desktop PC is equipped with a powerful quad core Xeon processor for multi-tasking. Together with 4/8/16GB of RAM, a spacious 500/1000/2000GB Hard Drive for your files, Ethernet connectivity for internet browsing and a Nvidia Quadro GFX graphics card Certified on all industry-leading applications and featuring automatic configuration of display settings, delivers optimal performance for maximum productivity. 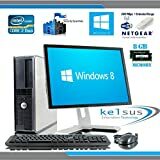 This desktop is a great choice is for professional, home and office use.